Weight / Stone: 72.00 lbs. Face Ft. / Pallet: 31 sq. ft. 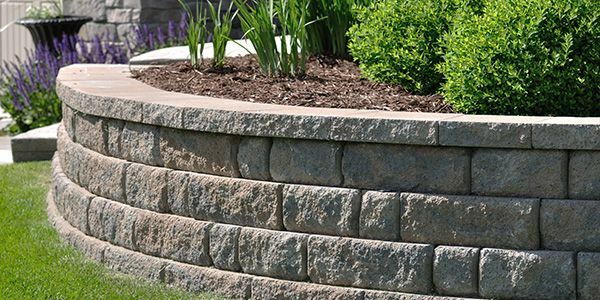 The Anchor Diamond® retaining wall stones continue to provide economy of effort in a structural, finished product. The patented rear lip facilitates construction and ensures proper alignment and a precise setback. The Anchor Diamond® stone is available in the distinctive straight or beveled face style and in a wide variety of colors and blends. The endlessly versatile Anchor Diamond® transforms retaining walls into works of art. It's the perfect choice for most commercial, municipal, or residential walls. With its superior engineering and flexibility, it outperforms traditional cast-in-place, timber, boulder, and crib walls. For an attractive, environmentally friendly retaining wall, choose the original, Anchor Diamond®.